Home World News and Views Africa and the World Belgian paratroopers to crush rising Congo rebellion? A rising alliance calling themselves “The Resistance Patriots of Dongo” (Patriotes-Résistants de Dongo) has gained currency and recruits after Congolese people learned that the Dongo resistance forces were fighting against Rwandan Tutsi troops in the little frontier town of Dongo. Sources in Congo’s capital Kinshasa report that an emergency “crisis” meeting was convened in Brussels on Friday, Nov. 28, 2009, after a distress call was sent by Congo-Kinshasa President Hypolitté Kanambe, known to the Western world by his alias, Joseph Kabila Kabange. According to intelligence sources, the Belgian military attaché in Kinshasa has been instructed to lay the groundwork for the arrival of a detachment of elite Belgian Armed Forces (BAF) paratroopers as soon as possible, before mid-December. Pitched battles involving RDF occurred in past weeks on Nov. 22-24 and Nov. 26-28 in the Dongo region. Along with RDF regulars, MONUC troops from the supposed international “peacekeeping” mission have been fighting alongside Tutsi Rwandan soldiers infiltrated by Rwanda, with the Kabila government’s support, into Congo’s national army, the FARDC. On Dec. 2, 2009, the remote strategic airport town of Libenge, near the Central African Republic, fell to the new rebellion, which is expanding and spreading with foreign backing. Towns in Equateur Province have been falling one by one to the rebellion, sending Kinshasa’s elites into a scramble on Dec. 3 and President Kabila into a security panic. Now the entire Congo has been launched into a state of massive fear, warfare and insecurity, and the house of cards – propped up by Western corporations and military – comes tumbling down. The international media has completely blacked out this story, reporting only an ethnic conflict over fishing rights. Faced with almost two months of suppressing information about the Dongo crisis in Equateur, MONUC is faced with the prospect of full disclosure – or launching another massive campaign of damage control and disinformation. The Tutsi forces in the FARDC include infiltrated RDF and “ex-”CNDP forces from the National Congress for the Defense of the People (CNDP), the extremist terrorist militia that sprouted out of the Kivu Provinces but is heavily backed by Rwanda and infiltrated with thousands of extremist Tutsis. Thousands of CNDP militia forces were integrated into the FARDC military in 2009 in a strategic maneuver championed by James Kabarebe and Paul Kagame and their U.S. and U.K. backers. These “ex-”CNDP wear FARDC uniforms, with some units commanded by FARDC officers – whose loyalty might first be to Congo, and not Kabila – while others are commanded by “ex-”CNDP officers serving Kabila but loyal to Rwanda. The CNDP is one of the pivotal causes of the massive destabilization of Eastern Congo, along with the many other Rwandan and Ugandan interests maintained by the organized crime networks run out of Rwanda (Paul Kagame) and Uganda (Yoweri Museveni). The formal military integration process involving so-called “ex”-CNDP forces is resented by many Congolese and Rwandan people as a logical step in the secret plan by Tutsi extremist forces to dominate both the Democratic Republic of Congo and the Great Lakes region. Rwandan Defense Forces are not exclusively Tutsis but are controlled and highly regulated by the secret extremist Tutsi network maintained by Paul Kagame, James Kabarebe and others of the 40 top war criminals indicted by the Spanish court on Feb. 6, 2008. Much ado is made in the international press, based on propaganda cranked out by the Kigame regime and its supporters, that Rwanda’s is a power-sharing government, that Hutu-Tutsi reconciliation has been a huge and lasting success, and that the RDF and intelligence services are comprised of non-Tutsi. Anyone who remotely steps out of line, in or out of Rwanda, will immediately be targeted, accused of genocide revisionism, negationism or participation in “the genocide” itself. President Kabila reportedly asked Central Africa Republic (C.A.R.) President Francois Bozizé to intervene and flank the resistance forces through the remote frontier town of Zongo, DRC, also in Equateur Province, across the border from Bangui, the C.A.R. capital. The two presidents share a common enemy, Jean-Pierre Bemba and ex-forces of the Movement for the Liberation of Congo (MLC). Jean-Pierre Bemba is under arrest at the International Criminal Court, thanks to Bozizé and Kabila, charged with war crimes in C.A.R. Bozizé is occupied with his own insurrections and guerilla insurgencies in C.A.R., having come to power by force in a March 2003 coup d’etat against Ange-Félix Patassé, C.A.R. president from 1993-2003. Patassé, in exile in Togo, will clearly be an interested party in the Dongo rebellion, given Kabila’s relations with Bozizé. Military and intelligence from France, U.S. and Chad all meddle in C.A.R. 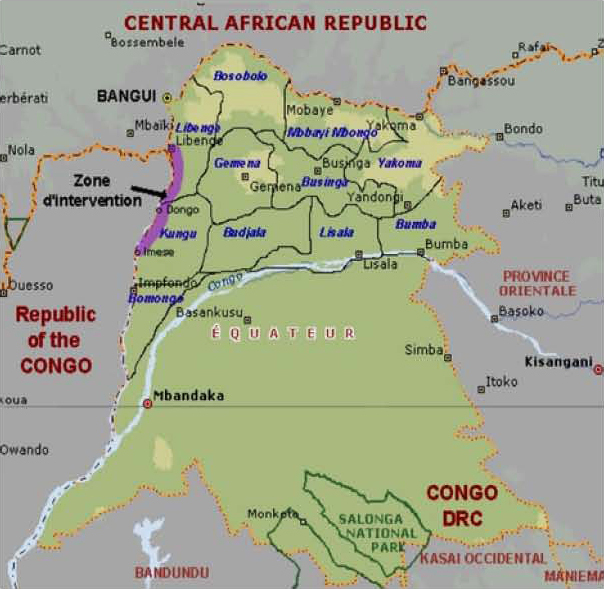 Kabila is reportedly furious at Congo-Brazzaville and its President Sassou-Nguesso for allowing veteran rebel guerrillas to attack Congo-Kinshasa on its western Oubangi River frontier (see map). The very first military intervention by U.N. Blue Helmets anywhere occurred in the Democratic Republic of Congo during the secession of Katanga Province (1960-63). The U.N. occupied Congo again in the “Congo Crises” (1964-66). Both occupations involved Belgian paratroopers and other Western mercenaries. The Congolese people were shafted. These illegal foreign occupations by the “international community” – under the guise of the United Nations – served to insure Western control of the diamond, copper, uranium and cobalt mines of Katanga and Kasai. Billed as “peacekeeping” operations, this misnomer set the stage for present day misunderstanding of the true MONUC role as an armed combatant protecting the corporate interests of predatory Western capitalism. Now, 50 years later, following more than a century of Belgian-Anglo-American-Franco-Israeli big business profits and slavery in Congo – with 10 million deaths under King Leopold (1885-1908), with a brutal Apartheid dispossession and military occupation under Belgian colonial rule (1908-1960), with countless deaths under the U.N. occupations of 1960 to 1965, with tens of millions of deaths under the U.S. client state regime of Joseph Mobutu (1965-1996), with more than 10 million deaths since the Pentagon-backed invasion of 1996 – the Belgians are reportedly again planning to rescue their military client-partnership in Congo-Kinshasa. The elite Belgian paratroopers would be deployed first to Bangaboka Airport in Kisangani, in Congo’s eastern Orientale Province. Kisangani is the site for the V.S. Naipal novel “A Bend in the River” and the proverbial “heart-of-darkness” outpost where Henry Morton Stanley organized the genocidal red-rubber and ivory pillage for Belgium’s King Leopold. Today, Western-owned plantations and logging companies reap their high profits through mass slavery of Congolese people in the Kisangani region. To conceal President Kabila’s illegal Belgian intervention from international public opinion, Brussels, Kinshasa and MONUC plan to dress Belgian paratroopers as “peacekeepers” to be deployed out of Kisangani as MONUC “Blue Helmets” bound for Equateur and Dongo. The leaders of the rebellion in western Equateur Province have reportedly forged an alliance with other disaffected Congo-Kinshasa forces in the eastern Kivu provinces. This alliance is united against the Kabila regime and its allies, including MONUC and AFRICOM. Sources in Kinshasa report that the Patriotic Resistance Forces of Dongo are now aligned with Gen. Dunia, a Mai Mai leader operating against the joint operations of the RDF-FARDC-MONUC nexus in the Fizi and Barako areas of South Kivu. Joseph Kabila is a Black pawn in the great game by white foreigners and multinational corporations to control and plunder Central Africa. Like Congo’s historic leaders, Patrice Lumumba (1925-1961) and his paternal namesake, the former President Laurent Desiré Kabila (1939-2001), Joseph Kabila would quickly be assassinated if he diverged from the hidden agenda of Western capital. Now however, internal hatreds and domestic disaffections threaten Joseph Kabila’s regime. Joseph Kabila is a Black pawn in the great game by white foreigners and multinational corporations to control and plunder Central Africa. The RPF/A killed everyone in its path, no matter their ethnicity: Hutu, Tutsi or minority indigenous Twa people. The so-called “Tutsi” RPF/A killed Tutsis in Rwanda during their four-year invasion, and afterwards, because Maj. Gen. Paul Kagame and Gen. James Kabarebe and their “exiled” Tutsi conspirators in Diaspora – dubbed the “Jews of Africa,” a “people without a homeland” – did not trust any Tutsis who stayed behind in Rwanda after Hutu President Juvenal Habyarimana came to power in 1973. 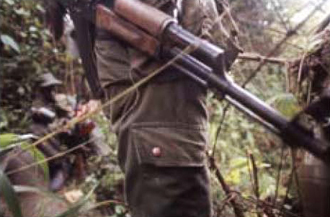 The RPF/A also killed everyone in their path because their plan from the start was to eliminate as many people as possible, to depopulate Rwanda of the soon-to-be problematic landowners, businessmen, farmers and peasants – mostly the majority Hutu population, but also Tutsis – and repopulate Rwanda with Ugandans and Tutsis who had been living comfortably in Western countries. It was about big business, corruption and greed. Now, after more than 15 years of massive Western propaganda proclaiming an organized, systematic elimination of the Tutsi people by the Hutu leaders of the former Rwandan government, the official Rwanda genocide story has finally collapsed. A genocide revisioning is imperative and, given the recent acquittals at the International Criminal Tribunal on Rwanda (ICTR), between December 2008 and December 2009, it is well under way. In sharp contradistinction to the tired establishment refrain, the entrenched sacred narrative accusing the “Hutu leadership” of an “organized” and “planned” genocide in the so-called 100 days of slaughter between April 6 and July 1994 – a narrative defined by victor’s justice – were the countless acts of genocide committed through a spontaneous uprising of the Hutu masses. These were Hutu people who had been brutalized, disenfranchised, uprooted and forced from homes; people who had witnessed massacres and rapes of family members; people who were themselves the victims of brutal atrocities; people who knew of crematoriums and mass graves filled with their friends, families and neighbors who were both Hutu and Tutsi. These were reportedly more than 1 million internally displaced Rwandan Hutus, people who had been terrorized by the RPF/A from October 1990 to April 1994, as it butchered its way into Rwanda, and possibly over 1 million Burundian refugees, Hutus who suffered massive reprisals in Burundi after the first civilian president, Melchior Ndadaye, a democratically elected Hutu, was assassinated by the Tutsi military in October 1993, and his successor, President Cyprien Ntaryamira, was assassinated on April 6, 1994. On April 6, 1994, they responded to the extremist Tutsi onslaught with a vengeance. There was killing on all sides; that is not in dispute. This was a war, a bloody conflagration of horrors. But the numbers don’t add up, the dead don’t compute, the labels “Tutsi” and “Hutu” become circumspect. The propaganda story is quite different from the facts, and no one has yet to write a true and comprehensive account not biased by fear, interests, imperial arrogance or whiteness. After seizing power in July of 1994, the extremist Tutsi network continued to perpetrate atrocities, including massacres, assassinations, tortures and disappearances, and the network moved into Congo-Zaire in 1996 and persists in Rwanda and Congo to this day. The modus operandi of this terrorist structure is to perpetrate crimes and blames them on the victim populations. In the beginning, many Congolese supported President Kanambe, alias Kabila, ignoring his origins, hoping that he would share power, that he would develop the Congo, build roads and schools and, especially, that he would forestall and evict Ugandan and Rwandan agents, provocateurs, mining cartels and war criminals from the 1996-2001 war years. 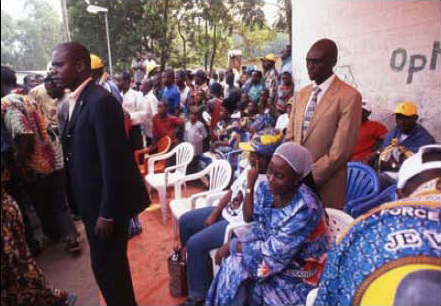 In July of 2006, prior to the presidential elections, I traveled on the campaign trail with President Kabila’s sister, Janet Kabila, around Kinshasa and into bush towns nearby. The Kabilas doled out cash and propaganda – t-shirts, caps, flyers, buttons, food, alcohol – and they rallied entire villages with a five-piece marching band. To the uneducated and impoverished masses of the interior, the Kabilas pledged roads and schools within next three years. They were the usual empty promises made by the usual empty politicians. 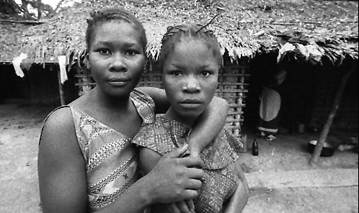 The Congolese people have seen nothing but misery and death delivered from within and without the vast Congo. The Western media broadcasts the suffering in Congo, but the propaganda is simplistic disinformation. The Western “news”-consuming public eats it up and dismisses the Congo, abandoning the people whose lives are determined in part by the raw materials stolen from them in a state of war and organized crime. High visibility Western organizations, in particular the ENOUGH and Raise Hope for Congo projects and their wealthy backers, the International Crisis Group and Center for American Progress, have lobbied college students and Western governments to action, always pushing for legislation, and licensed by capitalism and the major mass media to speak as the only bona fide experts on the Congo, Rwanda, Sudan and Uganda. They also advance military solutions over diplomatic or other peaceful solutions. William Jefferson Clinton’s former national security insider John Prendergast is their leading cheerleader. There’s a reason Prendergast is all over the news, appearing at colleges where ENOUGH and Raise Hope’s advance publicity includes expensive color brochures and posters. John Prendergast was the expert of choice for CBS 60 Minutes’ “Blood Minerals” broadcast, nationally televised in the United States on Nov. 29, 2009, which was an advertisement for ENOUGH, the IRC and so-called “humanitarian” organizations. These lobby and flak entities are working to displace and neutralize all true international grassroots efforts to help the Congolese people take control of their own resources and future, and they cover for hidden Western interests. Beholden to powerful Western corporate interests, the most powerful originating from Belgium, U.S.A., Israel, Canada, Britain and Germany, but also including Australian, Japanese, South African and Dutch interests, the Kabila regime, backed by the MONUC military occupation and the U.N. Security Council, has delivered the Congo’s people one disappointment and outrage after another. Eastern Congo about to explode too? A major source of ongoing conflict in the Kivus, Gen. Bosco Ntaganda, was rewarded in January 2009 for playing along with the Kabila-Kagame-MONUC charade of “arresting” CNDP-RDF war criminal Gen. Laurent Nkunda. To their credit, the U.N. Panel of Experts, in their recently “leaked” report of November 2009, exposed the appointment of Gen. Bosco Ntaganda as CNDP-FARDC commander, which Kagame and Kabila officially denied. Gen. Ntaganda commanded CNDP-FARDC units responsible for massive war crimes under the joint “Kimia” operations in the Kivus launched with MONUC backing in January 2009. Ntaganda is an insider and – if arrested and sent to the supposedly neutral ICC – he is purportedly a huge risk to Paul Kagame, James Kabarebe, Laurent Nkunda and Joseph Kabila. The International Criminal Court indicted Gen. Bosco Ntaganda for war crimes committed in DRC in May 2008. The ICC is a political instrument used to selectively target certain individuals and militias, while ignoring more substantial state sanctioned actors like Paul Kagame, James Kabarebe, Yoweri Museveni or former U.S. National Security Council member Walter Kansteiner. Sources in Kinshasa report that Gen. Ntaganda may imminently trigger a new war between CNDP and FARDC forces in the Kivus, with the blessing of Joseph Kabila and Paul Kagame, who seek to protect Ntaganda from the ICC. Given the recent secret infiltrations and sanctioned integrations of CNDP and RDF into FARDC units during 2008 and 2009, this would create havoc and trigger immense suffering, on top of the already unprecedented depopulation of the Great Lakes people. Gen. Ntaganda will likely create a new military faction, sources report, yet another acronym to confuse obtuse Western foreign policy experts – yet another militia licensed to kill civilians in the soup of bloodshed, depopulation and impunity. “During the [presidential] election the majority of the Congolese voted for Bemba,” says Congolese human rights activist Yaa-Lengi Ngemi, “even though Congolese people knew that Bemba also killed Congolese as a stooge of Uganda. The choice was between a Congolese criminal and a foreigner, a Rwandan criminal. So they voted for the Congolese criminal, or “mwana mboka” (native son). The elections rigging in Congo was multi-faceted, with all kinds of irregularities and manipulations on all sides. The “international community” backed the Kabila win. Since 1996 more than 10 million Congolese people have died across the vast country, with the current death toll in the eastern provinces alone at some 1,000 people per day. There are millions of refugees in the Great Lakes member states, and now more than 92,000 people are uprooted in Western Congo due to recent fighting. During his brief tenure as president, Joseph Kabila tried to balance out power interests through a combination of bribery and brute force. He gave Paul Kagame’s gang carte blanche over mining and land in the Kivu provinces. Extortion, racketeering, open occupations and secret infiltrations of Rwandan forces became the norm, and he has persisted in this pattern to this day. Since 1996 more than 10 million Congolese people have died across the vast country, with the current death toll in the eastern provinces alone at some 1,000 people per day. In Western Congo, home to Kinshasa, Kabila gave President Eduardo Dos Santos and Angola carte blanche over oil concessions in Bas Congo Province in exchange for providing presidential security forces and to counterbalance extremist Tutsi expansionism out of Rwanda. In March 2009, DRC’s oil minister, Rene Isekemanga Nkeka, accused Angola of stealing Congo’s oil. Many Congolese parliamentarians resent Kabila’s foreign alliances and can no longer be bribed into submission. The Angolans hate Kagame and the Rwandan Defense Forces (former RPF/A), and vise versa. 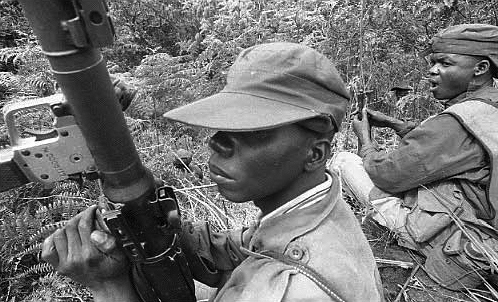 The RPF/A teamed up with Angolan UNITA rebels fighting against President Dos Santos after the Angolans cornered and shamed RPF/A troops in Bas Congo during the war; the two armies also fought on opposing sides in Congo (1998-2001). Next door to the vast Congo-Kinshasa, President Dennis Sassou-Nguesso in Congo-Brazzaville is one of Joseph Kabila’s most enduring enemies. The Congo River separates the two presidents in Brazzaville and Kinshasa, and one of the Congo’s largest tributaries, the Oubangi River, separates DRC’s Equateur province, running its course northeast along the border of Congo-Brazzaville and then the Central African Republic. President Sassou-Nguesso was a close ally of Rwanda’s former Hutu President Juvenal Habyarimana, apparently assassinated by the Tutsi extremist RPF/A “Zero Network” on April 6, 1994, and he was friend and ally of Joseph Mobutu. Brazzaville has harbored Mobutu’s ex-Forces Armées Zaïroises (ex-FAZ) since 1996-1997, and it harbors Rwandan elements that fled the AFDL genocide against Hutu refugees in Congo-Zaire (1996-1997). Sources suggest there are at least 300 ex-MLC (Movement for the Liberation of Congo) and more than 10,000 ex-FAZ troops available for the Dongo rebellion. Rwandan refugees in Congo-Brazzaville include civilian survivors of the 1994 exodus from Rwanda and the subsequent international war crimes committed by the Paul Kagame and James Kabarebe and their troops in DRC from 1996 to 1998. Uganda People’s Defense Forces also helped hunt and massacre Hutu refugees. Thus many Rwandan refugees in Brazzaville are former liberation fighters hostile to the terrorist Kagame regime for its “blame-the-victims” inversion of the Rwanda “genocide” story and the mass murder of millions of Hutu people from 1990 to the present. Sassou-Nguesso, Dos Santos, Ali Bongo and his father, Omar, Mobutu, Habyarimana – all of these current and former Central African regimes align(ed) themselves with French and Israeli security and intelligence interests  – and all seek to counterbalance and limit Tutsi extremist expansionism in Central Africa backed by the Anglo-American alliance. Equateur Province is the site of major untapped petroleum reserves. Belgian, French, Portuguese, German and U.S. families and corporations control vast tracts of land being denuded by rapacious industrial logging. There are also Western-owned plantations with modern day plantation slavery involving tens of thousands of Congolese people subject to terrorism by state paramilitary services. The outside world hears little or nothing about the Western-owned logging and plantation concessions producing timber, coffee, cocoa, palm oil and rubber through modern day slavery. Similarly, the immense untapped petroleum reserves beneath the Congo River basin and its rainforests in Equateur province remain undisclosed by Western institutions – including World Wildlife Fund (WWF), USAID and Care International – involved in possessing and depopulating these rainforest lands for Western corporate interests that benefit through the Kabila regime. According to Congo researcher David Barouski, cassiterite (tin) mined from the bloody Kivu provinces in Eastern Congo also passes through the networks of the plantations and logging interests in Equateur and Orientale. Recognizing the growing disaffection amongst his own military and intelligence services, President Kabila is surrounded by trusted elite Angolan Special Forces. Since Joseph Kabila came to power in 2001, the elite Guard Républicaine (GR), controlled directly by the president outside the military chain of command or any civilian or judicial oversight, has been expanded to some 15,000 elite, heavily armed forces deployed at all strategic locations around the country. Sources in the intelligence sector in Congo-Kinshasa claim that the GR is predominantly comprised of elite Angolan Special Forces, with a token number of Congolese to put a proper face on things. Kabila has also reportedly moved all ammunitions depots off Congolese FARDC military bases in Kinshasa, though Rwandan FARDC (“ex”-CNDP) and Angolan troops remain heavily armed and supplied. Angolan troops backed Kabila during the deadly battle for Kinshasa against Jean-Pierre Bemba and MLC loyalists in March 2007. Enraged by MLC attacks that claimed some 23 Angolans, including a senior officer, the Angolan forces ruthlessly retaliated, causing massive civilian casualties. Thousands of bodies were collected and dumped in mass graves and in the Congo River. At the time, President Dos Santos convinced Congo-Brazzaville President Dennis Sassou-Nguesso to block ex-FAZ troops in Brazzaville from crossing the Congo River to join the MLC fight. This time, Sassou-Nguesso has allowed ex-FAZ and ex-MLC to cross the border and join the Dongo rebellion. Sources claim that MONUC has collaborated with the Kabila security apparatus in their efforts to seize and eliminate MLC captives. These captives included some 150 former combatants, along with their wives and children. Reports from Kinshasa suggest that these MLC are being systematically eliminated in what amount to extrajudicial executions. There have been massive arrests and illegal detentions of young men in Kinshasa and outlying areas in the past month. In the past week, Congolese newspapers reported that escaped prisoners had been shot. However, sources indicate that these “escapees” were killed in prison. Such actions are routine for the Kinshasa security apparatus. Any time that Kabila suspects or discovers a coup, street children and young men are rounded up and detained – often involving intimidation and beatings – by the Presidential Guard. Sources in Kinshasa also say that Kabila’s forces rounded up scores and possibly hundreds of young civilian men in Maluku, a former Jean-Pierre Bemba MLC stronghold some 70 kilometers from Kinshasa. Kabila is worried that an insurgency against him will come from Maluku. Kabila has good reason to be alarmed. There have been at least four serious coup attempts against Kabila over the past two years; two of these occurred in 2009. One recent unreported coup attempt occurred in Kinshasa on May 18, 2009, at 7:30 p.m. when Kabila was returning from Mbakana, reported to be the Kabila clan’s privately fortified “farm” security compound, also some 70 kilometers from Kinshasa. When the presidential procession set off down the Boulevard de 30 Juin, Kinshasa’s central artery, on May 18, a sniper, lying in ambush, opened fire on the presidential Mercedes Jeep at the intersection of Wangata Avenue. Kabila had switched vehicles and was riding in a Nissan Patrol like those used by members of parliament. Following the attack, Kabila ordered the systematic destruction of all the public kiosks and pavilions along the Boulevard de 30 Juin and the indiscriminate round-up and arrest of young men in Kinshasa. The attack reportedly involved five commandos. All media inside Congo were forbidden from reporting on the May coup attempt, reportedly on the personal orders of President Kabila. Several media outlets of the Congolese Diaspora reported the events. It is also true that “coups” and “attacks” in Kinshasa have been staged by the Kabila government and by opposition as devices to manipulate public opinion or justify retaliatory action. In Oct. 12, 2009, Col. Floribert Bofate Lihamba was arrested in Lubumbashi, Katanga Province, the heart of Congo’s most lucrative western mining operations, and transferred to a prison in Kinshasa. A top security agent in President Kabila’s Presidential Guard Républicaine (GR), and a former member of the Special Presidential Security Group (GSSP) under President Laurent Kabila, Col. Lihamba is accused of planning a coup d’etat. On Oct. 21, 2009, President Kabila survived the second most recent attempted coup d’etat, another recent pivotal event in Congo unreported by the Western press or Congolese media. Informed in advance of the impending attempt on his life, President Kabila had curtailed all public appearances and was reportedly again holed up with Angolan troops on his “farm” security compound outside Kinshasa. According to Congolese intelligence sources, ex-Forces Armées Zaïroises (ex-FAZ) commandos crossed the Congo River seeking to assassinate Kabila. The commandos all reportedly originate from the Mobutu and Jean-Pierre Bemba strongholds around Gbadolite in northwestern Equateur. The arrested officers include four majors (Yogo, Zwafunda, Mokwesa and Ngombo); five captains (Koli, Nzale, Gbaka, Kongawi and Salakoso); nine lieutenants (Libanza, Masisi, Gerembaya, Mbuyi, Ndongala, Ngani, Kpdobere, Nzanzu and Sido); and four sergeants (Kongo, Dondo, Lisala, and Lite). One of the former President Mobutu’s closest advisers, Honoré Ngbanda – the “Terminator” – is also rumored to back the uprising in Dongo. Ngbanda held various positions under Mobutu, including minster of the interior, ambassador to Israel and head of the Mobutu’s notorious SNIP, the National Intelligence and Protection Service (Service National d’Intelligence et de Protection). Honoré Ngbanda’s ties to other Mobutu era big men likely include the Bongo family (Gabon) and Jewish-American diamond kingpin Maurice Templesman (United States), whose De Beers-affiliated diamond interests were partially displaced when the Kabila regime partnered with Israeli businessmen Dan Gertler and Benny Steinmetz. Gertler and Steinmetz cemented their interests in Congo-Kinshasa through former U.S. President G.W. Bush and former U.S. State Department official Jendayi Frazer. South Africa is home to several former high commanders from the former Mobutu regime of Zaire. Former Security Police Chief Gen. Kpama Baramoto, former Special Forces Cmdr. Gen. Ngabale Nzimbi and former Zairean Defense Minister Admiral Mudima all now reside in South Africa and are clearly interested in overthrowing Joseph Kabila. In past weeks, Kabila has attempted to replace Congolese intelligence agents with Rwandans drawn from the CNDP, the extremist Tutsi terrorist network out of Rwanda. This has stirred further anger amongst the Congolese members of the FARDC and the National Intelligence Agency (ANR), Congo-Kinshasa’s secret service. In March 2009 the Western press reported a “tribal dispute” and “ethnic clash over fishing rights” in the little Western Congo outback town of Dongo. The dispute reportedly began between two different ethnic groups. However, the newly announced “Resistance Patriots of Dongo” claim that President Kabila’s agents manipulated the parties of the dispute and escalated armed hostilities. In October 2009 President Kabila and John Numbi – one of his top military advisers – dispatched FARDC troops under the command of Gen. Benjamin Alongaboni to Dongo to negotiate peace with resistance forces. Gen. Alongaboni, a Congolese son hailing from Equateur Province and the first FARDC officer on the scene, secured a negotiated peace with Dongo area combatants. Soon after, however, President Kabila sent RDF forces – in FARDC uniforms – who enraged Congolese in the region and provoked hostilities by killing some local people and destroying the possibilities of peace negotiations. The Resistance Patriots of Dongo retaliated and FARDC under the command of Gen. Alongaboni began defecting. Now President Kabila is uncertain who is with him and who is against him. All FARDC troops in the Democratic Republic of Congo are on full security alert, prevented from leaving the country or taking leaves of absence. Gen. Benjamin Alongaboni and the few troops that did not defect to the resistance were moved to nearby Gemena military center where he is currently under surveillance by President Kabila’s security and intelligence operatives. Gen. Alongaboni is an adjutant general to Kabila’s trusted FARDC insider John Numbi, formerly the head of FARDC Air Forces and now inspector general of the Police National Congolaise (CNP). Meanwhile, the “Dongo Crisis” has blossomed into a full-blown Congolese rebellion against international occupation forces and the powerful Kabila-Kagame clique. Over the past three weeks, civilians and former combatants have been flooding into the remote Dongo region to join a growing rebellion against the now hated military regime of President Joseph Kabila and his Western corporate business and military partners. Hundreds of Congolese Armed Forces (FARDC) – of ethnic Congolese origin – have deserted and joined rebellion ranks with Congolese civilians and various military elements of past rebellions. The Resistance Patriots of Dongo is reportedly comprised of Congolese-FARDC deserters, former Forces Armées Zaïroises (ex-FAZ) and former MLC rebels. The “Dongo Crisis” has blossomed into a full-blown Congolese rebellion against international occupation forces and the powerful Kabila-Kagame clique. Thousands of ex-FAZ and elite troops of Mobutu’s former Special Presidential Division (DSP) fled Congo-Kinshasa to Congo-Brazzaville between 1996 and 1998 when the Pentagon-backed insurgency led by Rwanda and Uganda swept across the Congo (Zaire) and drove out Zaire’s long-time strongman Joseph Desire Mobutu. Sources in Kinshasa say that President Kabila seeks to frame and accuse Mobutu’s former intelligence chief Honoré Ngbanda and ex-MLC leader Jean-Pierre Bemba, who is already under arrest for war crimes at the International Criminal Court, in a propaganda ruse to justify the international intervention in Equateur and legitimize further military aggression by the Kabila-Kagame-MONUC nexus. Kabila hopes for strategic gain by claiming that the Dongo uprising is purely an MLC uprising. By convincing his white international patrons that the MLC is the problem, Kabila hopes to further purge his government and the country of MLC supporters. In September 2009, armed assailants shot up the residences of DRC Minister of Foreign Affairs Alexis Tambwe Mwamba and another minister, Olivier Kamitatu, both ex-MLC supporters who have joined Kabila, in a drive-by shooting; other assassination attempts have also been reported. Sources in Kinshasa say Kabila’s security apparatus staged these assassination attempts to create further international sympathy for Kabila, to discredit the MLC and manipulate the ICC proceedings against Jean-Pierre Bemba. Officials in Kinshasa have been threatened in response to fears that Jean-Pierre Bemba will wiggle and bribe his way out of the ICC war crimes charges and return to Congo. Given the highly political nature of the already corrupted ICC, the fear is not unfounded. President Kagame and President Yoweri Museveni have a long history of “pseudo-operations” and “false-flag operations” that blame and punish the victims after secret operations and atrocities that are actually committed by disguised RDF and UPDF (Uganda Peoples Defense Force) soldiers. Congolese people everywhere were outraged by the Eastern Congo FARDC military operations with RDF and UPDF forces early in 2009, but Kabila and partners heaped one insult on top of another by airlifting RDF across Congo to the far western Equateur to attempt to crush the Dongo resistance. MONUC and AFRICOM supported the RDF airlift operations. The Kabila government has reportedly agreed to base AFRICOM out of the remote east-central Congo River city of Kisangani, also the site of a secret U.S. military-intelligence “fusion cell” linking Uganda, Rwanda and Congo-Kinshasa in a tripartite cooperation agreement focused on minerals and mining. The details of the “base” are unknown, but Kisangani will likely be one of AFRICOM’s many “lily-pad” bases. Bound for the Dongo rebellion in mid-November, RDF crossed from Gisenyi, Rwanda, to Goma, DRC, and were then flown from Goma to Kamina Air Base in Katanga, a military transport hub used for the Belgo-American-U.N. mercenary occupations during the Katanga secession (1960-63) and “Congo Crises” (1964–67). The RDF battalion was next flown to Bandundu Province and from there they joined President Kabila at his “farm” security compound outside Kinshasa. The RDF troops were reportedly next moved to the 42-acre campus of the U.S. Embassy-affiliated American School in Kinshasa (TASOK), near the notorious Camp Tshatshi military base, and then flown to Gemena airport in Equateur. The Col. Tshatshi Military Camp in Kinshasa hosts the defense department and the Chiefs of Staff central command headquarters of the FARDC. The TASOK campus was used for RDF troops because they would not be welcome amongst Congolese-FARDC at Camp Tshatshi. De Moerloose supplies Kabila with presidential jets and other toys. John Numbi reportedly orchestrated the joint military operations between RDF and FARDC that began in January 2009. The main overt military campaigns were “Umoja Wetu,” a joint operation between FARDC and RDF, and the “Kimia I” and “Kimia II” operations, which were FARDC operations supported by MONUC. Congolese FARDC troops deployed by Kabila to the Dongo area refused to fight and instead defected to the rebel cause rather than kill their Congolese brothers and sisters for the private enrichment of foreigners and the pro-Rwanda alliance of Kabila and Kagame. Thus President Kabila has been forced to deploy to Dongo only those FARDC units comprised exclusively of “ex”-CNDP Tutsi units loyal to Rwanda. By mid-November 2009, international humanitarian agencies began reporting thousands of refugees flooding across the Congo River to Congo-Brazzaville, with 54,000 now in Congo-Brazzaville and 38,000 IDPs (internally displaced persons) in Congo by Dec. 1, according to the United Nations High Commission for Refugees (UNHCR). Congolese FARDC troops deployed by Kabila to the Dongo area refused to fight and instead defected to the rebel cause rather than kill their Congolese brothers and sisters for the private enrichment of foreigners and the pro-Rwanda alliance of Kabila and Kagame. The Resistance Patriots of Dongo are claiming to have inflicted high casualties on the RDF-MONUC-FARDC forces dispatched to Dongo and surrounding areas. Several towns have been taken, lost and retaken in pitched battles against RDF-MONUC-FARDC forces. While the conflict in Equateur slowly escalated from March to October and deteriorated quickly after that, MONUC’s press and information corps have been mute about the rebellion. MONUC issued one tiny press report on Nov. 26, after resistance forces shot up a MONUC helicopter that flew to Dongo to resupply the RDF-MONUC-FARDC ground troops. Five of the 25 to 30 personnel on board were injured, and the pilot took off and flew the chopper to Congo-Brazzaville. None of the personnel aboard the MONUC chopper – or their nationalities – was identified. A short Western media propaganda blurb circulated by Agence France-Presse attempted to discredit the rebellion and cover for MONUC’s involvement in open military aggression against Congolese people. Titled “Armed group claims firing at UN chopper in DRC,” the AFP blurb also confirmed the Resistance Patriots of Dongos’ strike against a MONUC helicopter. 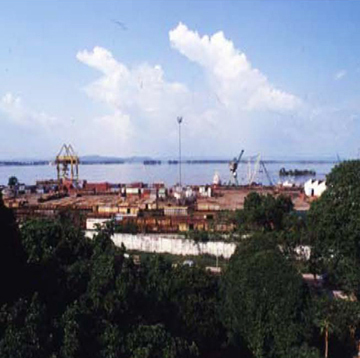 On Dec. 3, 2009, the Dongo resistance forces intercepted a tugboat pulling two big barges carrying 2,500 tons of arms and ammunition destined for Dongo RDF-MONUC-FARDC forces. The commander of the FARDC operations involved in moving the weapons, Col. Nyav, was killed during the clashes; Nyav had previously been commanding RDF-MONUC-FARDC troops at Dongo. The ethnic Congolese FARDC under Col. Nyav’s command jubilantly defected to the resistance after seizing the boat and weapons. 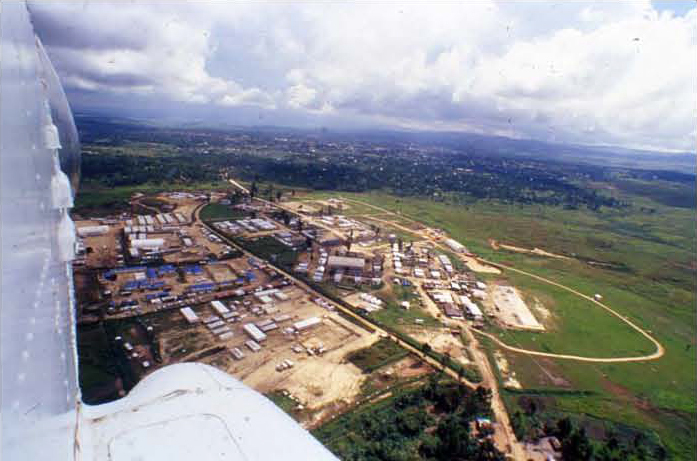 Also on Dec. 3, the strategic Congolese airport town of Libenge fell into the hands of the Resistance Patriots of Dongo. The resistance forces now control the towns of Dongo, Libenge, all the territory located along Oubangi River, the localities of Bomongo, Kutu, Kungu, Saba-Saba, Buburu and the Catholic mission of Bokonzi. The Resistance Patriots of Dongo next plan to take Mbandaka, the major administrative city on the Congo River – and the end of the line for thousands of Hutu refugee women and children executed in cold blood by the RPF/A and the AFDL on the banks of the Congo River there in 1997. “We take the engagement before God and before all the Congolese to topple the puppet regime currently in place in Kinshasa,” the Nov. 26 resistance statement added, according to the AFP. “The helicopter was delivering supplies to peacekeepers recently deployed to the town of Dongo,” reported Reuters, basing their “news” report on MONUC Public Information Officer Madnodje Mounoubai. Reuters reported “around 20 Ghanaian peacekeepers” deployed by MONUC in Dongo. Sources in Kinshasa on Dec. 5 report “massive violent fighting in Libenge and Gemena areas,” involving 1,000 Congolese National Police (PNC) and 100 Ghanaian MONUC troops and two MONUC helicopter gunships. MONUC sources in Kisangani indicate that two additional MONUC helicopter gunships are “standing by” for possible immediate deployment to Equateur. The MONUC “peacekeeping” in Congo is a $1 billion a year operation. The refugee count by Dec. 14 had risen to more than 115,000 Congolese villagers left homeless and forced to flee. Reports from Kinshasa indicated that “white” mercenary forces were fighting alongside of FARDC and MONUC troops with helicopter gunships; the mercenaries were reportedly Algerian. While reports filtering out of the bush indicated very high civilian casualties, the United Nations was reporting nothing. For this report these RDF-disguised troops will be designated “RDF” to separate them from other FARDC troops with Rwandan allegiances. Private investigations and interviews, Kinshasa, Equateur (Mbandaka, Basankusu, Bosondjo, Lisala) and Orientale (Kisangani, Isangi, Lokutu) Congo, 2004-2007. See, e.g., Spain’s Feb. 6, 2008, indictment issued by High Court Judge Andreu Merelles charging 40 current or former high-ranking Rwandan military officials with serious crimes, including genocide, crimes against humanity, war crimes and terrorism, perpetrated over a period of 12 years, from 1990 to 2002, against the civilian population and primarily against members of the Hutu ethnic group. See, e.g., Davenport and Stam, “What Really Happened in Rwanda?” Miller-McCune, Oct. 6, 2009, http://www.miller-mccune.com/culture_society/what-really-happened-in-rwanda-1504. See, e.g., Keith Harmon Snow, “The Rwanda Genocide Fabrications,” Dissident Voice, April 13, 2009, http://dissidentvoice.org/2009/04/the-rwanda-genocide-fabrications/. Jeffrey Gettleman, “Congo army helps rebels get arms, UN finds,” New York Times, Nov. 25, 2009. See Keith Harmon Snow, “Congo’s President Kabila: Dynasty or Travesty?” Toward Freedom, Nov. 13, 2007, http://towardfreedom.com/home/content/view/1171/1/. Private investigations, Democratic Republic of Congo, July-August 2006 and February-March 2007. See Keith Harmon Snow, “Behind the Scenes: Warlord’s Deadly Battle in Congo,” Toward Freedom, Aug. 19, 2007, http://towardfreedom.com/home/content/view/1096/0/. I previously but incorrectly reported that Joseph Kabila married Sandrine Nguesso, the sister of the president in Congo-Brazzaville. See Keith Harmon Snow, “Congo’s President Kabila: Dynasty or Travesty?” Toward Freedom, Nov. 13, 2007, http://towardfreedom.com/home/content/view/1171/1/. Interviews with Rwandans in the Diaspora, Keith Harmon Snow. United Nations High Commission for Refugees. See Keith Harmon Snow, “The Crimes of Bongo: Apartheid and Terror in Africa’s Gardens of Eden,” Cyrano’s Journal Online, July 17, 2009, http://www.bestcyrano.org/?p=2827. David Barouski, “Transcript of David Barouski’s 10/19/08 Presentation for Congo Week in Chicago, IL.,” World News Journal, Oct. 22, 2008, http://africannewsanalysis.blogspot.com/2008/10/transcript-of-david-barouskis-101908.html. Elwyn Blattner and his plantations holdings are revealed in the 2008 documentary film “Episode III: Enjoy Poverty” by Dutch filmmaker Renzo Martens, www.enjoypoverty.com. Wilf Mbanga, “Zimbabwe/DRC: Zimbabwean troops guard President Kabila in Congo,” The Zimbabwean/UK, Aug. 12, 2005, http://www.afrika.no/Detailed/10159.html. See Wayne Madsen, “Admission of Rwanda to Commonwealth caps off assassination, genocide, and civil war,” Online Journal, Dec. 4, 2009, http://onlinejournal.com/artman/publish/article_5342.shtml. Stewart M. Powell, “Engagement in Africa,” airforce-magazine.com, July 2009. Eric Elliot, “U.S. Begins Flying Rwandan Peacekeeping Equipment to Darfur,” U.S. AFRICOM Public Affairs, Jan. 14, 2009, http://www.africom.mil/getArticle.asp?art=2457. United Nations: Letter dated Nov. 9, 2009, from the Group of Experts on the Democratic Republic of the Congo addressed to the chairman of the Security Council Committee established pursuant to Resolution 1533 (2004), “leaked” November 2009. “La radio Bendele reçoit Mr Ambroise LOBALA MOKOBE Porte-parole des Patriotes-résistants de Dongo,” Radio Bendele, Nov. 22, 2009, http://www.radiotvbendele.com/vivvo_general/269.html. Unsigned, “Armed group claims firing at U.N. chopper in DR Congo,” AFP, Nov. 26, 2009. Joe Bavier, “Congo gunmen fire at U.N. helicopter, five wounded,” Reuters, Nov. 26, 2009. Bemba Saolona’s company, Scibe CMMJ, was implicated by the U.N. in smuggling weapons to UNITA during the Angolan Civil War: Johan Peleman, “The logistics of sanctions busting: the airborne component,” (PDF file), page 303. In 2006-07, Police Nationale Congolaise were outfitted with high-tech radio communications, funded by the United Nations Development Program, purchased from New Zealand, http://www.taitworld.com/main/download/l4/76_police_nationale_congo-indd.pdf. “DR Congo troops take back town from tribal forces: Govt.,” SAPA-AFP, Dec. 14, 2009. Keith Harmon Snow is a war correspondent, photographer and independent investigator and a four time (2003, 2006, 2007, 2010) Project Censored award winner. He is also the 2009 Regent’s Lecturer in Law and Society at the University of California Santa Barbara, recognized for over a decade of work, outside of academia, contesting official narratives on war crimes, crimes against humanity and genocide while also working as a genocide investigator for the United Nations and other bodies. The first UCSB Regent’s Lecturer, in 1960, was Aldous Huxley. This story first appeared at Dissident Voice, where many of his other stories are posted. He can be reached at keith@allthingspass.com. To learn more, visit his website, All Things Pass, and Friends of the Congo. Now its not only savages in Congo, but animal worshippers. How stupid do they think we are? How stupid are people?? Compare the real story above with the white racist media system’s propaganda published yesterday. The United Nations is keeping a tight lid on all information regarding civilian casualties, but reports indicate a huge human toll yet again. I found the palm oil plantations online, but no the untapped petroleum. Also, is Care International actually a property owner in Congo, with legal title? Re “Similarly, the immense untapped petroleum reserves beneath the Congo River basin and its rainforests in Equateur province remain undisclosed by Western institutions – including World Wildlife Fund (WWF), USAID and Care International – involved in possessing and depopulating these rainforest lands for Western corporate interests that benefit through the Kabila regime.” I understand very well how the WWF gets away with this sort of thing, for the sake of biodiversity and yeah, sure. . . but how does Care International justify owning property? Given who they are, it makes sense that they would, but what’s the scam? Also, how’s USAID play it? When you say you “found teh palm oil plantations on line” what does that mean? CARE is partnered with WWF and USAID in a huge US GOV program called CARPE. (Central Africa Regional Program for the Environment??) and its follow on Congo Basin Forest Partnership (CBFP). I mean that when I went online to see if I could find out what resources are at stake in Equateur Province, the palm oil plantations readily came up. I didn’t find petroleum reserves, nor did I find timber, but I didn’t have all day to look. Thanks much for the map. It’s recently come out that there are huge oil reserves in and around Haiti, which may finally explain the mystery of why the U.S.A. has been so determined to control Haiti that they’d all but drop a nuclear bomb to do so. “Timber” and “Equateur Province” yields a number of references online. This wasn’t a complaint. I said thanks for that detail. 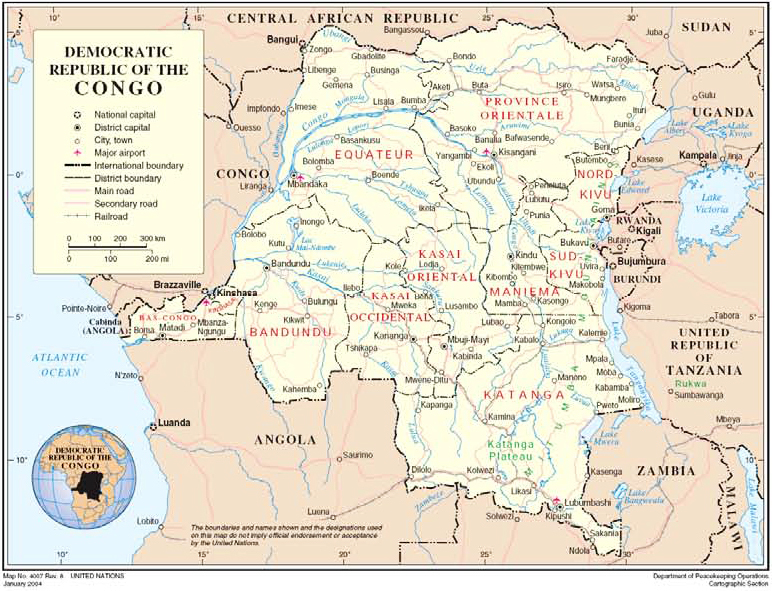 I often feel that we need a resource map of Congo to understand what’s going on there. Also, re your argument with Danny Schechter’s pathetic Global Research article dismissing this article of yours: Schechter’s article is such a pointless, meandering patchwork of clichés that I’m disinclined to spend time on it, and more inclined to try and understand this, which is long and dense, and not easily taken in with one pass.